Should You Control the Environment for Your Children. What you should try to control and what you should let go. 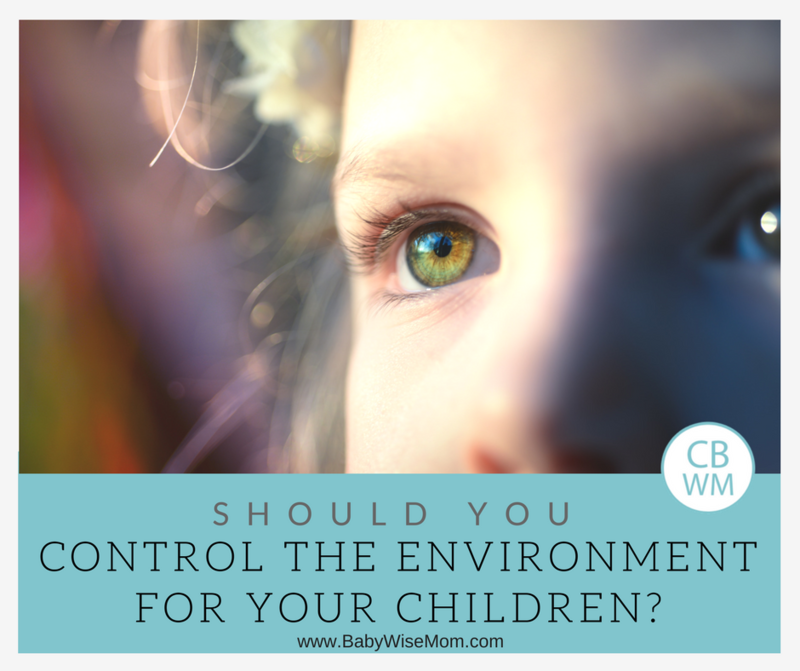 Controlling Environment for Preschoolers. 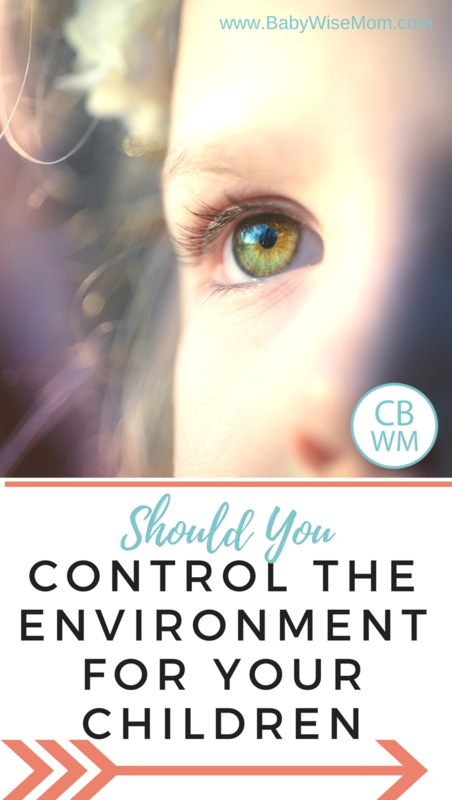 I had requests to continue this forward for older children, so now I will talk about controlling your environment for children ages 5-7. Even if you do not have a toddler, it would be a good idea to read the toddler post first to get an idea of where I am building from for the toddler years. I would recommend the same for the Preschool post. It would also be a good idea to read through Fine Balance of Protecting Children. I think this age range has the most variables associated with it of all of the age ranges we have discussed so far. With toddlers, I feel pretty comfortable giving a blanket rule to my children and knowing that a toddler can only handle X amount of outside influence. The same goes for the preschool age. As children get older, however, rules need to be more personalized from child to child. What your 6 year old can and can’t handle will depend on so many factors. One will be what did you teach and enforce while the child was younger. Another will be how much freedom has the child had up to this point. Another will be the child’s individual disposition and personality. Another is your community and your child’s friends. Another is your child’s exact age; what I allow for my five year old is very different than what I allow for my seven year old. On Becoming Childwise (affiliate link) has two great chapters to really help you think through what is best for your individual child so far as adding freedoms go. These are chapters nine and ten. Here are some basic guidelines to think about as you allow freedoms in this age. First, Childwise points out that you don’t want to force your child to grow up faster than she needs (page 149). Leave time for the child to be a child. When you put your child in positions of freedoms she is not yet able to handle, it sets her up for needing lots of correction and for much frustration on the part of the parent. occasion is age-appropriate. You want to allow for this growth into new responsibilities. This brings us to the discussion on parenting in the funnel. I often see talk surrounding the funnel only focusing on allowing too many freedoms–many don’t consider the need to also ensure you allow enough freedoms. Both extremes will create frustration in both you and your child. For our toddlers and preschoolers, I think we often allow more freedoms than the child is able, but I think as the child gets older–into this 5-7 range–we tend to not allow enough freedoms, at least with our oldest child. Figuring out the right freedoms for your individual child is always a fine balancing act. It takes as much effort as finding that perfect waketime length in the baby days. You need to be observant and tweak things as necessary. Chapter ten in Childwise is all about the process of transferring ownership of behavior to your child. This is the process you are in at this point. You are figuring out what needs to be your child’s responsibility and what you still need to have primary control over. Who is in charge of remembering to bring the library book back to school? Who is in charge of remembering to put the shoes away? Who is in charge of the dishes after the child is done eating from them? These types of things show you how much responsibility your child can and cannot handle. You want to transfer responsibility over to your child. This is a time as discussed in Parenting With Love and Logic that you allow your child to learn responsibility by allowing mistakes while the stakes are low. Noticing responsibility toward simple tactile things at home can help you gauge what your child can handle with friends when you aren’t around. When your child visits a friend’s house, will she be responsible enough to respect your rules when you are not there to remind her of them? Stay in tune with your child’s behavior when she comes home from friends–this will give you huge clues into what she can and cannot handle. You will notice which friends are better influences and also how long your child can handle being away from home at one time. At this age, you still want you to be the primary influence in your child’s life, not friends. Now here are some things I have noticed in Brayden as he has gained more freedom and more responsibility. One is that when you truly hand over that responsibility to the child, he steps up to accept it. I noticed this strongly at the beginning of first grade. The teachers expected the children to be responsible for themselves. They expected them to be self-directed, remember their own responsibilities without being reminded, to stay on task, to take care of their own work, and be in charge of their homework and things like library books. The teachers never accepted an excuse of “my mom didn’t….”–they were reminded it was their responsibility, not mom’s. I was completely amazed to see how quickly these students stepped up to meet all of these expectations. I have noticed that Brayden likes responsibility. He likes to have the task of making his own sandwich, for example. He likes to be of real help in doing chores around the house. He likes to feel like he is contributing to the household. I have noticed he cannot handle being away from home too much in one day. During the school year, he could not go to school for the day and then spend much time playing with neighbors before he became “wise in his own eyes.” I have conversely noticed that he does benefit from some peer interaction during the summer months. When he spends all of his time at home, it is just as detrimental to his behavior as being away from home too much. He needs some freedom, but not too much. As you parent a child in this range, always evaluate yourself to make sure you are giving this little child of yours enough exposure outside of your little greenhouse of wall-of-water while not giving too much. It is a fine balance, but with observation, you will come to know the right actions for your child.